If you've been wondering which film has won the most Academy Awards, you likely already have seen many of the top contenders. Movie buffs are often interested in movie trivia, particularly in fun facts related to the Oscars. The merit award ceremony night is often one of the hottest of the year for those with a passion for cinema. Thankfully, there are numerous fun facts regarding previous winners. Oscar night is often one of the best of the year for those who have had a part in recently well-received movies. Many stars look forward to the nominations morning -- usually a day in late January or early February -- to see if their achievements have been recognized. After that, stars have to wait until the big night in late February or early March to find out if they've won the little gold statue named Oscar. The statue itself is not only a symbol of the Academy but the property of it, and those who receive Oscars are made aware that if they ever decide that they do not want their prize, it must be promptly returned to the Academy for storage! 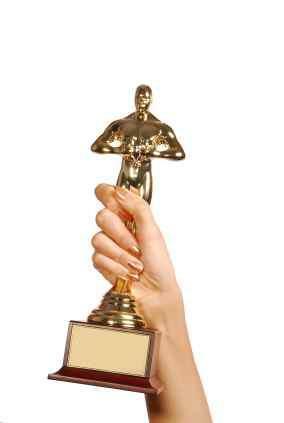 So Which Film Has Won the Most Academy Awards? Depending on how you ask the question, "Which film has won the most Academy Awards?" the answer may change. If you're asking which films themselves have won the most honors, many look toward the current top three: Ben-Hur, Titanic and The Lord of the Rings: The Return of the King. Each of these films has won 11 total Oscars. While The Lord of the Rings: The Return of the King is a top winner, the film is also known for being undefeated as it won in every category for which it was nominated. Gigi and The Last Emperor previously held the most Oscar wins before these three movies began their reign. Gigi and The Last Emperor each won nine Oscar categories in their year of nomination. There are also only three movies that have won five of the top Oscars out there (Best Picture, Best Director, Best Actor, Best Actress and Best Writing). These films are: It Happened One Night, One Flew Over the Cuckoo's Nest and The Silence of the Lambs. The five Oscar wins these movies achieved are looked at as "The Big Five" by many who tune in just for to see these nods. While there are numerous films that have received many awards, there are also numerous stars who have also won for their work on popular films. Katherine Hepburn leads the pack with the most Oscar wins for Best Actress while Ingrid Bergman, Jack Nicholson and Walter Brennan tie for second with three wins each. Walt Disney himself has the most Oscar wins of any single person with a current count of 26 (though six of those awards were given after his death). His part in numerous Disney movies has paved the way for the expansion of animated recognition at the Oscars. Sometimes winning isn't everything. There are several films that hold unique honors with the Academy even though they didn't win the most golden men. For example, The Turning Point and The Color Purple each received 11 nominations but not a single Oscar win. Titanic and Master and the Commander: The Far Side of the World also are the only two films to receive the honor of being nominated in all seven technical film categories. While figuring out which film has won the most Academy Awards may seem like a simple task, there are other ways to ask the question that change the matter a bit. For example, just because a film or actor won many honors, that doesn't mean he has taken home any of the larger awards at the show, and there have been many films over the years to do just that. However, the films that tend to win the most are always the films you are most likely to remember!